Local artist Hannah Rothstein re-imagines classic natoinal-park posters — with a twist. The Everglades’ flourishing mangroves and the alligators that lounge below their shade have been replaced by stumps and contaminated water. Crater Lake has dried, its Wizard Island now surrounded by a neon algae bloom. The Great Smoky Mountains have become enveloped a wildfire blaze, and the tall timbers of the Redwoods have splintered and broken. The year is 2050, and our future’s been devastated by the wrath of climate change. But America’s National Parks still need to get paying customers through the turnstiles! 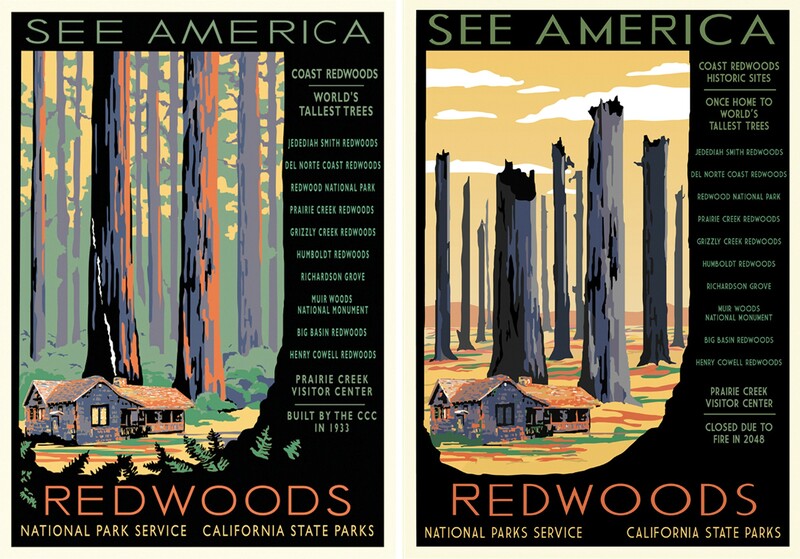 National Parks 2050 is Hannah Rothstein’s re-imagining of the iconic art deco posters created between 1935 and 1943 by the Works Progress Administration’s Federal Art Project that have since become ubiquitous pin-ups on the walls of the outdoors-inclined. The Berkeley artist created this project because, frankly, she’s mad. After being driven to act by, among other things, the electoral shock of Trump, Rothstein came up with a list of national parks (in “red” states and “blue”) and researched the effects global warming would have in each. 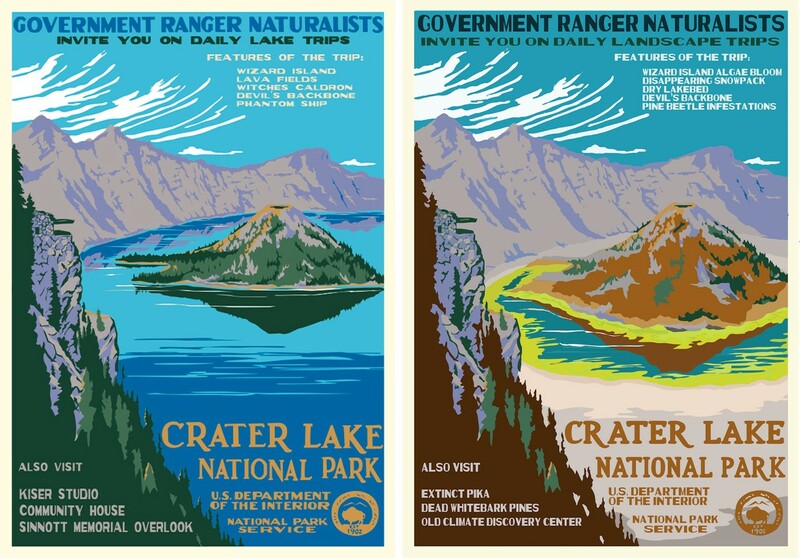 The message of the seven altered posters that constitute the series is clear: climate change will irrevocably deform our most treasured landscapes. The imagery is a punch to the gut, but more than that, it’s a set of instantly impactful images that are easy to share on the internet, not least because they’re a direct modification of something we’ve all seen before. All that’s part of the point. This isn’t Rothstein’s first brush with viral fame. 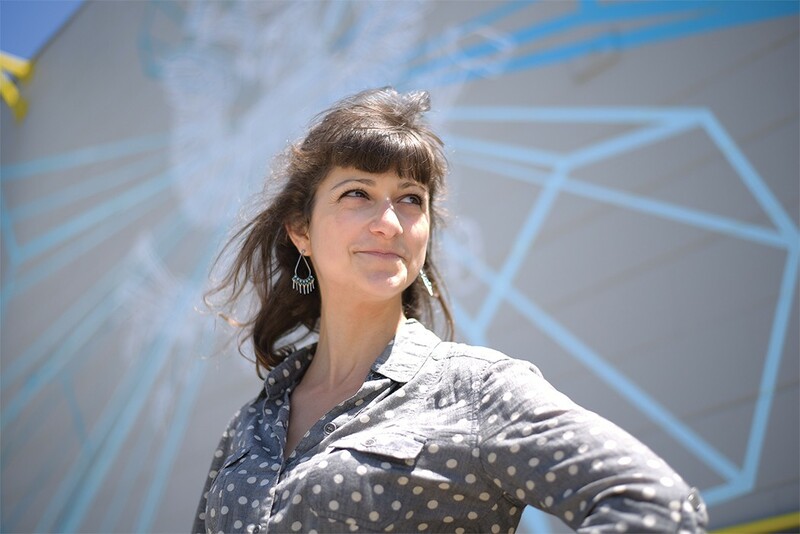 Originally from upstate New York, Rothstein has been in the Bay Area for seven years, building her artist portfolio in between gigs. Previous to National Parks 2050, her work was more pun-infused than profound. There’s Thanksgiving Specials (a series of holiday dinners painted in the style of famous artists), Dr. Dreidel (c’mon, you get it), and a pair of books: Yoga for Bros, detailing poses that’d fit in at a frat house, and the self-described The Cocktail Hour Coloring Book. While going viral seems on the outside like a Darwinian and democratic battle waged with an organic series of clicks and likes, the effort needed to accomplish the feat is in fact, as time-consuming as making the art itself. After the actual production is finished comes the queasy act of cold-pitching to publications. When it works, the day’s jammed with a seemingly never-ending barrage of phone calls and emails from an army of freelance reporters looking for usable quotes. But this media blitz is embedded in Rothstein’s process of creating art. “I do think about what people will want to share, because I want to make work that resonates, and therefore is something, inherently, they’d want to share,” she said. While the stakes are dramatically heightened in this case — trying to persuade people about climate change is different, yet no less awesome, than sticking Dr. Dre on a dreidel — any kind of art is, at its core, a form of communication. As such, it only works when someone’s on the other end of the line. Trying to go viral is bringing along a bullhorn. How one park and hacienda helps transform the neighborhood.